Views, Views, AMAZING Views from the very sought after Bel-Air Skycrest Community, this Gorgeous ONE STORY Contemporary Home invites sophistication with an open floor plan to capture the breathtaking views from just about every room. The City Lights and Jet Liner views just don't stop. Impressive grand entry leads to the beautiful view filled living room with a enchanting dual fireplace that blends into the perfectly comfortable view filled family room. with updates throughout. Master Suite with high ceilings and windows and slider across the entire view, walk in closets, his and hers vanities with elegant designer glass touches and details with lots of privacy with city view. Hardwood floors throughout. Crown molding. You will enjoy the natural lighting and flow from the indoors as well as the outdoors... you'll never want to leave. Stunning large lot with pool, spa, sitting area, fireplace, bar-b-que and grassy area and vista. 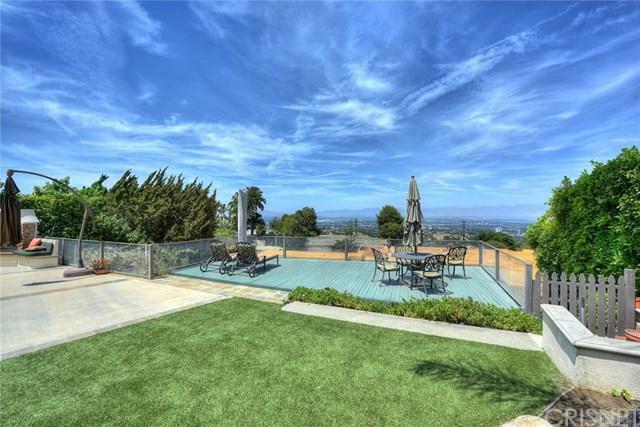 Near the best private and public schools and convenient access to UCLA, Westside, Valley, 405 & 101 FWYS.Neighboring some of the the best schools including Roscomare, Mirman, Milken, Berkeley hall, Stephen S. Wise and Curtis.